Tammy Kimpton completed her FRACGP in 2013 and currently works part-time in rural General Practice. 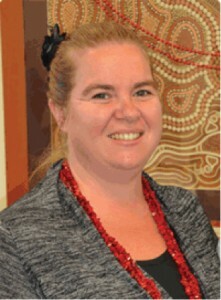 She is the president of the Australian Indigenous Doctors Association (AIDA) and has been a member since its inception. Over the years, she enjoyed contributing to many important roles in AIDA. Robert James is a Torres Strait Islander man who currently lives in Melbourne, Victoria. While working at the Bone Marrow Transplant unit of Royal Children’s Hospital as a research officer, he was inspired by a paediatric oncologist to pursue medicine. He graduated with an MBBS from the University of Melbourne in 2013. In 1866 the first Indigenous Canadian doctor completed her training and in 1899 the first Maori doctor graduated from medical school in the United States. Professor Helen Milroy, a founding member of the Australian Indigenous Doctors’ Association (AIDA), graduated from the University of Western Australia as Australia’s first Aboriginal doctor 84 years later in 1983. The number of Aboriginal and Torres Strait Islander medical graduates has increased to 180 with a further 261 Indigenous medical students studying at universities. In 2011 the intake of first year Indigenous medical students at Australian universities reached a new high of 2.5 per cent, matching the percentage of Australia’s Aboriginal and Torres Strait Islander population. AIDA is the peak representative body for Indigenous doctors and medical students, and strives to achieve the vision of Aboriginal and Torres Strait Islander people having equitable health and life outcomes. We do this by: providing a unique medical and cultural perspective on Aboriginal and Torres Strait Islander health; maintaining links between traditional and contemporary medicine; and growing and supporting current and future Aboriginal and Torres Strait Islander doctors. This vision is central to the work that AIDA undertakes and is embedded in our advocacy and policy work. AIDA also recognises the role of traditional healers who preceded contemporary medicine and to this day still remain active in Aboriginal and Torres Strait Islander communities throughout Australia: “The knowledge, wisdom, and skill of our traditional healers is becoming increasingly recognised within Australia as well as internationally…not only for the direct benefit of the community but to ensure that health practitioners are being educated in understanding and working with traditional healers to improve physical health and mental health outcomes.”  We are proud to have a strong relationship with the traditional healers who act as teachers, guides and leaders to our organisation. The inequality of health in Australia was brought to the wider public’s attention by the former Aboriginal and Torres Strait Islander Social Justice Commissioner, Dr Tom Calma AO, in the 2005 Social Justice Report. Subsequent to this report the Close the Gap Coalition was formed and the Close the Gap Campaign was launched. Close the Gap has raised the awareness of Indigenous health to all Australians and provides an opportunity for individuals to advocate for improvements in health. AIDA is a member of the Close the Gap Steering Committee and is also a signatory of the Close the Gap: Statement of Intent (2008) between the Australian Government, the opposition party, and peak Indigenous and non-Indigenous organisations. To ensure targets within the Statement of Intent are achieved there need to be systematic processes to ensure Aboriginal and Torres Strait Islander people have control over their own health. An emphasis on Indigenous people being a part of the decision making process and having access to culturally safe health services are examples of such processes. The Council of Australian Governments (COAG) has demonstrated support for the Close the Gap Campaign by keeping Indigenous health on the agenda of Commonwealth and State Governments. This commitment has led to the COAG Closing the Gap targets, they are: closing the life expectancy gap within a generation (by 2031); halving the gap in mortality rates for Indigenous children under five within a decade (by 2018); ensuring access to early childhood education for all Indigenous four year olds in remote communities within five years (by 2013); halving the gap in reading, writing, and numeracy achievements for children within a decade (by 2018); halving the gap for Indigenous students in year 12 attainment rates (by 2020); and halving the gap in employment outcomes between Indigenous and non-Indigenous Australians within a decade (by 2018). These targets highlight the importance of health, education, and employment all of which are crucial for improving the health and wellbeing outcomes of Aboriginal and Torres Strait Islander people. Another critical factor in improving health outcomes for Indigenous people is an Aboriginal and Torres Strait Islander workforce. The Australian Human Rights Commission addressed this in a recent summit: “The Indigenous medical workforce is integral to ensuring that the health system has the capacity to address the needs of Aboriginal and Torres Strait Islander peoples. Indigenous health professionals can align their unique technical and sociocultural skills to: improve patient care; improve access to services; and ensure culturally appropriate care in the services that they and their non-Indigenous colleagues deliver.”  One approach AIDA is using to develop and strengthen an Indigenous medical workforce is building meaningful partnerships. The partnership approach should be based on mutual respect and commitment to joint-decision making, priority setting and constant learning, and reflection. An example of the partnership approach includes AIDA’s Collaboration Agreements established with the Medical Deans of Australia and New Zealand, the Confederation of Postgraduate Medical Educational Councils, and more recently with the Committee of Presidents of Medical Colleges. Partnership with peak medical training organisations ensures that Indigenous health remains on the agenda across the medical training spectrum. The incorporation of outcomes in the Collaboration Agreements such as increasing the support for and retention rates of Indigenous medical students, trainees and fellows, and promoting medical education and training policy reform indicates a genuine commitment from the peak medical training bodies to support the Indigenous medical workforce at all levels. Building a culturally safe health workforce, both in numbers and competence, and culturally safe workplaces, are crucial to delivering high quality and sustainable health services to Indigenous people. Although we must strive to ensure that the Indigenous medical workforce continues to grow, collaboration with and commitment from our non-Indigenous medical colleagues is vital if we are to improve the health status of Indigenous people. One example of collaboration between Indigenous and non-Indigenous health professionals is the Inala Indigenous Health Service Southern Queensland Centre of Excellence for Aboriginal and Torres Strait Islander Primary Health Care, in Brisbane, QLD. In 1994 the centre only had 12 Indigenous people registered as clients, since implementing a number of strategies informed by the local community; it now has 10,000 registered Indigenous patients, 8,000 of whom are regular users. Strategies implemented by the service include: employing more Indigenous staff; creating a culturally safe waiting room; staff cultural awareness training; disseminating information to the Indigenous community; and promoting intersectorial collaboration. AIDA commends the work done by Associate Professor Noel Hayman and the team at Inala Indigenous Health Service Southern Queensland Centre of Excellence for Aboriginal and Torres Strait Islander Primary Health Care, for demonstrating effective collaboration and providing a good practice case study. Long term approaches to progressing improvements in Indigenous health need to also target the next generation of Indigenous health workforce with a focus on pathways into health careers for Indigenous youth. The age profile of the Aboriginal and Torres Strait Islander population is significantly younger than that of the non-Indigenous population. In 2011, around 36 per cent of the Indigenous population was aged less than 15 years, compared with 18 per cent of the non-Indigenous population. With regards to the education attainment of Indigenous people, 25 per cent of the population had completed year 12, compared with 52 per cent of non-Indigenous people, and 4.6 per cent of Aboriginal and Torres Strait Islander people had achieved a bachelor level degree, compared to 20 per cent of non-Indigenous people. If we are to develop an appropriate future Indigenous health workforce, greater attention will need to be given to developing the skills of the younger Aboriginal and Torres Strait Islander generation so that they are ready and able to pursue a career in the health sector. In April this year, under the auspice of AIDA, and in partnership with the following peak Aboriginal and Torres Strait Islander health organisations: National Aboriginal Community Controlled Health Organisation; Indigenous Allied Health Australia; Congress of Aboriginal and Torres Strait Islander Nurses and Midwifes; National Aboriginal and Torres Strait Islander Health Worker Association; Indigenous Dentists’ Association Australia; and the Australian Indigenous Psychologists Association, the inaugural Murra Mullangari: Pathways Alive and Well Health Careers Development Program was launched. Murra Mullangari: Pathways Alive and Well is targeted at addressing a critical area of need in the health industry, which is engaging young people with health careers; with a specific focus on Aboriginal and Torres Strait Islander youth who have expressed an interest in establishing a career in this sector. The Murra Mullangari: Pathways Alive and Well Program involved two components, the first being a residential workshop, held in Canberra. This component saw 30 Indigenous secondary students experience university life, be advised on a range of health career prospects and hear first-hand from Indigenous health professionals across a variety of health disciplines. The second component involved mentoring for participants, who are matched with an Indigenous professional in the health career of their interest. As future members of the medical profession we encourage all medical students to build their knowledge of, and engagement with, Aboriginal and Torres Strait Islander health. It is important to understand that cultural safety is not simply a module that can be completed as a part of your medical degree; it requires continuous learning and experience, maintenance of strong clinical skills, and the ability to understand patients holistically. This could be done through volunteering in Indigenous communities, placement at an Aboriginal Community Controlled Health Organisation, or associate membership with AIDA. It is important to build on the momentum developed through key collaboration agreements such as AIDA’s agreements with the Medical Deans of Australia and New Zealand, Confederation of Postgraduate Medical Education Councils, and the Council of Presidents of Medical Colleges. These partnerships enable a continued focus on the recruitment, retention, and graduation of Indigenous medical students, alongside support for trainees and fellows which is critical for the development and retention of a strong Indigenous medical workforce. The development of medical practitioners, Indigenous and non-Indigenous, who are culturally and clinically competent and passionate about social justice are integral to the health outcomes of Australia. The way you practice medicine in the future could facilitate generational change within the health sector and lead to health equity in Australia. This change could be you and your peer’s legacy; the only thing left to consider is what part you will play in delivery this outcome. Ngaanyatjarra Pitjantjatjara Yankunytjatjara (NPY) Women’s Council Aboriginal Corporation. Traditional healers of Central Australia: Ngangkari. Australia: Magabala Books; 2013. Australian Bureau of Statistics. Australian demographic statistics, March Quarter 2012. Canberra: Australian Bureau of Statistics; 2012. What details do we know about the Indigenous population? [Internet] 2013 Apr 10 [cited 2014 Sep 20]. Available from: http://www.healthinfonet.ecu.edu.au/health-facts/health-faqs/aboriginal-population. Australian Health Ministers’ Advisory Council. Aboriginal and Torres Strait Islander health performance framework: 2012 report. Canberra: Office for Aboriginal and Torres Strait Islander Health, Department of Health and Ageing; 2012. Australian Human Rights Commission. Close the gap: Indigenous health equality summit–statement of intent. Canberra: Australian Human Rights Commission 2008 Mar 20. Hayman NE, White NE, Spurling GK. Improving Indigenous patients’ access to mainstream health services: the Inala experience. Med J Aust. 2009;190(10):604-6. Department of Health and Ageing. National Aboriginal and Torres Strait Islander health plan 2013-2023. Canberra; Department of Health and Ageing; 2013. Overview of Indigenous health status. [Internet] [cited 2013 Aug 7]. Available from: http://www.healthinfonet.ecu.edu.au/health-facts/overviews/the-context-of-indigenous-health. Psychopathy: A disorder or an evolutionary strategy? Glibenclamide therapy as tertiary prevention of melioidosis for Type 2 diabetics.